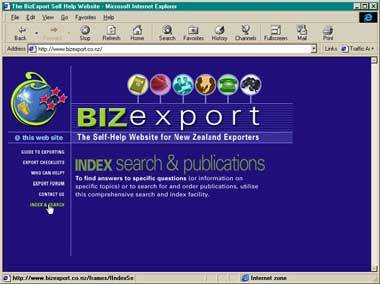 Developed a fully active self-help website for New Zealand exporters www.bizexport.co.nz , utilising Microsoft Visual C++ MTS components and server based ASP Script. 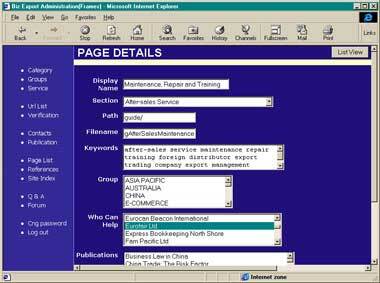 The site features incorporate a complete online web based administration facility (as shown in the second graphic above) to manage the majority of content on the site. Relevant publications are noted throughout content of the site with an online shopping basket giving the viewer the option to gather publications without leaving their area of interest. A database managed "who can help" facility is incorporated throughout the content of the site along with a consolidated hierarchical "tree view" page for instant reference. Graphic and textual content once again being controlled from the administration facility. The site has an extensive URL links page (global links) for exporters with an in built online URL verification facility to ensure that all site links sites registered are available and valid. Links deemed invalid are marked offline avoiding the dreaded "404 Page Not Found" message. The process initiated on request from the administration pages runs as a batch process in the background reporting directly to the database its findings.